Come Mix with Me is intended to solve all the “cocktail mixing mystery” by explaining all facets of a house bar in detail. It provides the answers with regards to utensils, glasses and ingredients needed for entertaining at home, as well as the various methods of mixing drinks. At the same time the necessary alcoholic ingredients have been carefully selected and limited to thirteen bottles plus sparkling wine. By starting with one bottle and adding the others one by one, the house bar owner will be able to learn the art of mixing step by step and, at the same time, have the advantage of being able to mix a surprisingly large number of the internationally known drinks. 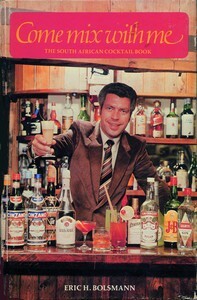 With some 365 authentic recipes listed, this book could well serve as a useful guide for the professional barmixer. The author’s main aim, however, is to share the art of mixing drinks with the reader by giving clear explanations and unified recipes from a limited stock, thus keeping the exenses as low as possible without compromising sophisticated drinking which is an essential part of gracious living. The chapter on hot and cold cocktail snack recipes is an added bonus to this practical guide to home entertainment and parties with a difference.